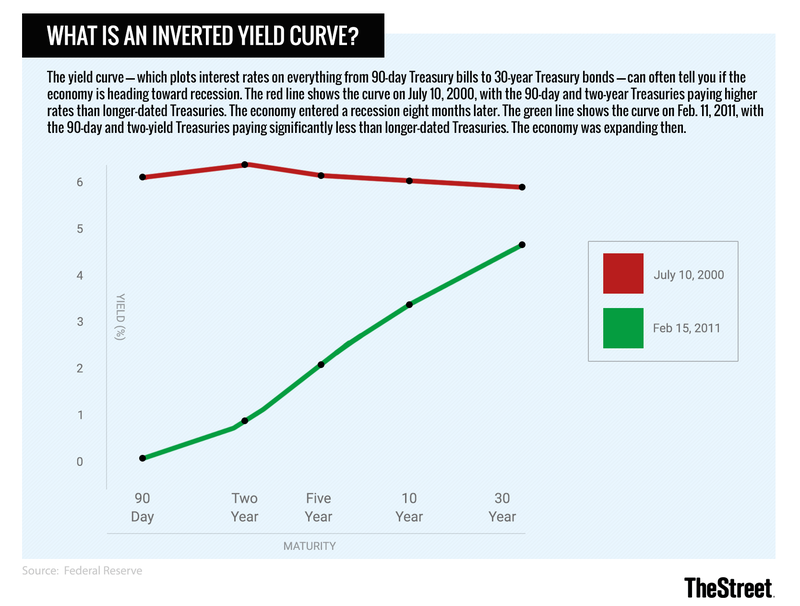 The yield curve has partly inverted. What exactly does that mean? If you follow the markets you probably know that the yield curve has partially inverted. You also probably know that this is a fairly big deal, because almost every financial reporter in the country keeps saying so. It may be less obvious why, exactly, everyone has freaked out about this. The answer, in a word, is recession. Odds are good that one could be looming. The yield curve compares the return on different bonds of equal credit quality over time. It charts otherwise identical bonds against their different maturity dates to report the return on investment in the short term vs. the mid- or the long term. For example, if a two-year AAA bond paid 1% and a five-year AAA bond paid 1.5%, they could present a yield curve of 0.5. The curve compares equal credit quality, because when the bonds are identical, the only thing that varies is their returns over time. You can build a yield curve out of any set of bonds, but the most common benchmark is the graph comparing yields on three-month, two-year, five-year, 10-year and 30-year U.S. Treasuries. This is what economists refer to when they discuss "the" yield curve. This is because U.S. Treasury debt is a critical indicator. Banks (and even some governments) use it as a universal store of value. It's the safest place to put your money because, recent political turmoil notwithstanding, you're virtually assured a return on investment. Treasury interest rates move inversely to investor confidence. When banks and investors feel good about the U.S. economy, yields go up. They feel confident putting their money into other sectors like mortgages and business loans, so Treasuries have to pay higher interest to compete. But when confidence declines, investors are more likely to seek a safe place for their money. Treasury bonds provide a unique form of safety, so their yields go down. OK, so now you know what a yield curve is and why we so carefully follow Treasury rates. Now, what's the big deal about "inversion"? Ordinarily the yield curve follows a predictable course in which long-term bonds outperform short-term bonds. Basically, the government pays more to borrow money for a longer time. This is known as a "positive" yield curve, because the difference between a long-term return and a short-term one is positive. From time to time, however, short-term bonds will yield more than the long-term ones. The curve becomes negative. This is what's known as an "inverted" yield curve. That's what happened on Monday. Both two-year bonds and three-year bonds began paying more than five-year bonds. Ten-year bonds are on their way there as well, which is what markets most closely focus on -- periods when the two-year Treasury yields more than the 10-year one. This means that demand for longer-term bonds now exceeds the demand for short-term instruments. Investors have begun prioritizing long-term security over access to capital. They worry more about losing their money than they do about missing an opportunity. This doesn't happen often. In fact, historically, it only happens in very specific situations: shortly before the start of a recession. The yield curve went negative in terms of the two-year vs. five-year and two-year vs. three-year Treasury in 2005/2006, 2000, 1988 and 1978, foreshadowing recessions. The only exception was in 1998, when the yield curve dipped very briefly for a month or two during the summer but didn't lead to a recession. For this reason, economists consider the yield curve a reliable bellwether for coming recessions. This doesn't mean that the market will collapse right away. Usually inversion precedes a recession by one or two years. So if historic patterns hold true, the economy will turn sometime in late 2019 or 2020. An inversion of the yield curve would ordinarily be enough to freak economists out all by itself. In this case, though, the yield curve joins a few other red flags. For several years, economists have warned of another recession if for no other reason than that we're simply due. Recessions tend to happen every eight to 10 years or so, and the last one hit in December 2007. Stock prices have also created a lot of anxiety. As the Dow Jones Industrial Average has soared in recent years, many market watchers have warned of potential overvaluation. Basically, investors have gotten too enthusiastic and are paying more than the underlying assets are worth. When that happens, the market eventually corrects. What do you know? The stock market is in a 1,000-plus point dive after several losses earlier this year. On Tuesday, the dollar took a hit against most major currencies. Oil prices, which have increased before every U.S. recession since World War II, spent most of 2018 going up. The cryptocurrency market, while relatively small, has collapsed by 85% over the past 12 months, wiping out more than $630 billion in value. Layoff announcements have already begun, particularly in the auto industry. Too, economists have long warned about the current administration's policies. The undeclared trade war that Donald Trump started with most of America's trading partners has spooked investors and industries alike. Despite government efforts to ease the pain of higher prices, core sectors like agriculture and manufacturing report that business has slowed down, and General Motors (GM - Get Report) personnel have confirmed that the company's layoffs were due to tariff-driven steel prices. There may not be many tools in the box if and when this recession hits. Over the past several year, the government has burned through the resources it would typically use to fight off a recession. Interest rates, while rising, have remained low by historic terms since 2008. The Federal Reserve typically responds to a downturn by cutting rates as a spur to lending, but right now there's not that much for it to cut. Government stimulus spending would be constrained by the $21 trillion national debt. While textbook economics recommends that Congress buy and hire to prop up the private market during a recession, this would be politically and (perhaps) economically difficult. Tax cuts, another go-to, have already been burnt up. Last December's cuts created what economists have called a "sugar high," essentially a spurt of consumer spending in an already growing economy. With this legislation's $2.3 trillion price tag and, again, high levels of public debt, another round of tax cuts would be difficult and (depending on their beneficiaries) may simply flood already liquid markets with unnecessary capital. This, more than anything, is the key problem that policymakers will face. If a recession does hit, the government may not have many resources with which to buy, hire or lend when we need it most.